If you’re a marketing manager, salesperson, or entrepreneur, you recognize that generating marketing messages is an integral part of the sales and marketing cycle. But did you know that writing to your prospective and existing customers, distributors, and your own employees can be your most powerful sales tool? Unlike the spoken word that quickly fades from memory, the written word has staying power—power that can effectively deliver your message while cultivating lasting relationships with customers and clients. 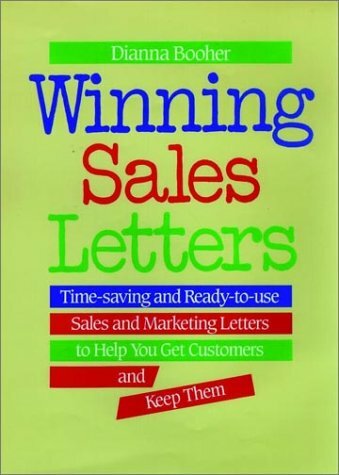 Now, Winning Sales Letters furnishes you with an efficient, fast way to generate those powerful written messages on all the routine and sensitive issues you face each day. From introducing your business to following up on an appointment. From dealing with a disgruntled customer to announcing the discontinuation of a product line. From welcoming a new sales rep into your organization to enouraging a distributor to increase volume. This book gives you more than 300 model letters on scores of sales, marketing, and service topics of concern to every business. Use the models verbatim, mix and match phrases, or customize the messages provided to achieve just the right tone for any important communication. Collectively, the models in Winning Sales Letters will save you time, strengthen your marketing position, and increase goodwill among customers and employees alike.